With Dramcember now drawing to a close it is time I added my derange ramble to the fray. This month The Baron chose to sample a whisky that The Baron had not had before (nay it not be a single malt). The Baron chose the Bulleit Bourbon. Now one could say Australia's exposure to bourbon is limited and in fact is not much better than that of tequila. What we see here in the local bottle-o is simply good marketing of sellable successful brands irrespective of quality. I mean seriously who in Australia drinks Fosters? It is a nasty brew generally only sold internationally. Yet I am sure it is the same for all the mid shelf bourbons, what we see here is a far cry from the US and half of what we have probably is not even considered drinkable in it's home. In saying all that I am still keen on running the bourbon gauntlet because so much of bourbon is the catalyst for Scotch whisky (as a generalisation re: casks). So what's the bitter The Baron asks. The Baron thinks of it this way...without the bitter the sweet just is not so sweet. For every average bourbon I try, just makes me more determined to find that one memorable one. You need to dram through the range, The Baron says, in order to know what you like. Someone whom says "this is great" does not mean it is great for you. Some may like the one legged amputee and praise her tricks, but then for others they will say it's just not cricket without the bat and balls. When I say The Bitter it is not like dating a crack whore whereby you know your going to get some but it's just not going to be pretty. No that is The Sour. Never mistake The Sour with The Bitter. The bitter is the things that come along and just let you know "yes there are better things to dram on." Bulleit Bourbon is The Bitter for The Baron. Again like all bourbons The Baron has tried, apart from Jack Daniel's, the flavour really is only lightly varied in depth, sweetness, flavour and or colour from any other bourbon on the shelf here in Australia. Tasting notes as always for bourbon is short and somewhat uninspiring. Too much said and not enough to say. To taste much like Wild Turkey...rich, sweet, oak(ish), but with an extra iron on the tongue element to it (possibly this is the rye content). Alcohol flavour is strong and dry(ish). Apparently the brand promotes 'smokiness' but I fail to find it even remotely (grasping at straws again as a point of difference). Finish is warming but short and saturates the gums much longer than in the throat. What can The Baron say as a rating? 4 out of 7. It is one of the more expensive mid shelf Bourbons and so it should stand out more and not less. Easy drinking and pleasant like most Bourbons but I would not say outstanding in any way. I have to say even though a Bourbon does make a good mixer with cola or in a cocktail it is much more interesting sipped straight. Appreciate The Bitter because without The Bitter, The Sweet just is not so Sweet. I have been trying a technique (no not tantric) to see what else I can gauge from bourbon and have found this to work. Leave just a wee drop in the glass and let it dry out overnight. What is left is an intensified smell of those key elements that are it's primary flavours. 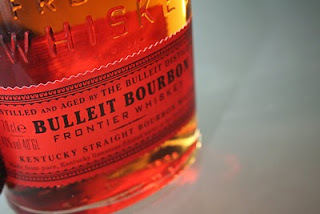 In the case of Bulleit Bourbon, the morning after finds it is close to sweet hickory wood chips much more than oak. As a reference point I find Makers Mark to retain an intense dry grass essence on similar experimentation. Note this technique does not seem to work with Scotch but rather only with bourbon.